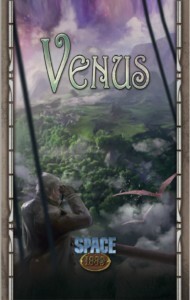 Modiphius have just announce the release of Space 1889: Venus, a major new source book for the Space 1889 RPG, steampunk Victorian roleplaying in the worlds created by Jules Verne, HG Wells and Arthur Conan Doyle. 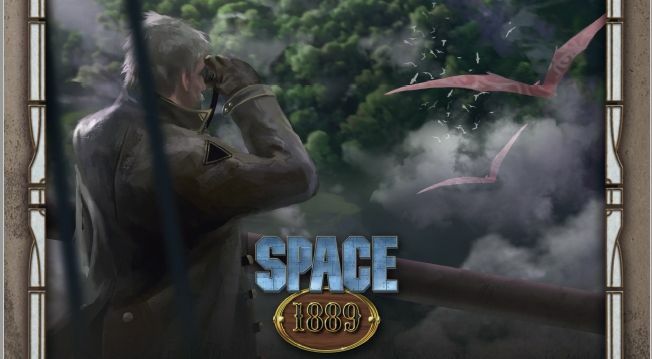 Available as a 178 page printed black and white book or as PDF, this marks the first of a new wave of releases for the Space 1889 RPG collection, following the recent reprint of the core book. With this source book you can now plunge into the “green hell”! Try your luck as a soldier-of-fortune in the pioneer settlements, or as a scientist, exploring the wonders of a new world. As a colonist you can create a new home far away from Mother Earth. Or you can choose to play a Venusian warrior defending his homeland against the cold, emotionless invaders from beyond space. It’s up to you! Also included is an extensive chapter on the “Ha”, as the Venusians call themselves, concerning the culture, the biology, and the young civilization of the alien Lizard-men that allows you to portray a Venusian authentically during play. You will also find extensive material on the unique flora and fauna of the Morning Star – not only new monsters to trouble your player characters, but also the innumerable exotic biological treasures flourishing on Venus. Inside is new equipment, sample characters and tips and advice on how to play adventures on Venus, as well as a detailed “chemistry set” with exciting new rules for inventions. These will allow your player characters to exploit the natural resources of Venus and develop new drugs, chemicals, and all kinds of bizarre and wondrous substances. Last but not least, we will also unveil many a secret that still lies hidden beneath the misty shrouds of the Green Planet. A new Warhammer 40,000 roleplaying game is coming – soon, you’ll be able to dive into the 41st Millennium in Wrath & Glory. Tabletop roleplaying is a very different experience from wargaming – rather than commanding your forces from above, you’ll be able to inhabit characters of your own design in imaginative collaborative storytelling. 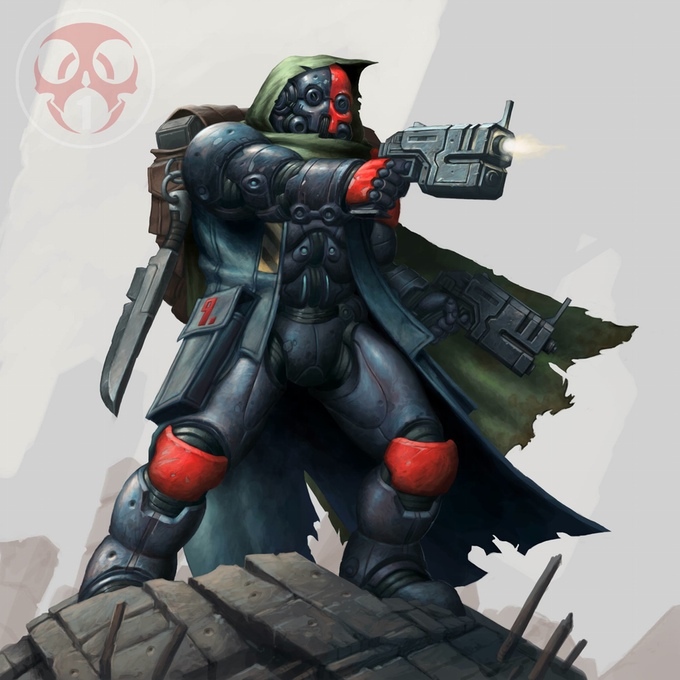 Wrath & Glory is currently in development at Ulisses North America, an experienced designer and publisher of several popular roleplaying games. We can’t reveal anything more at this point, but watch this space for updates and news, and get ready for your own adventures in the 41st Millennium. That is all – you can read it here – but no release date, no details. 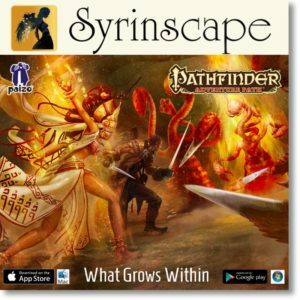 Are roleplay games the new skirmish games? 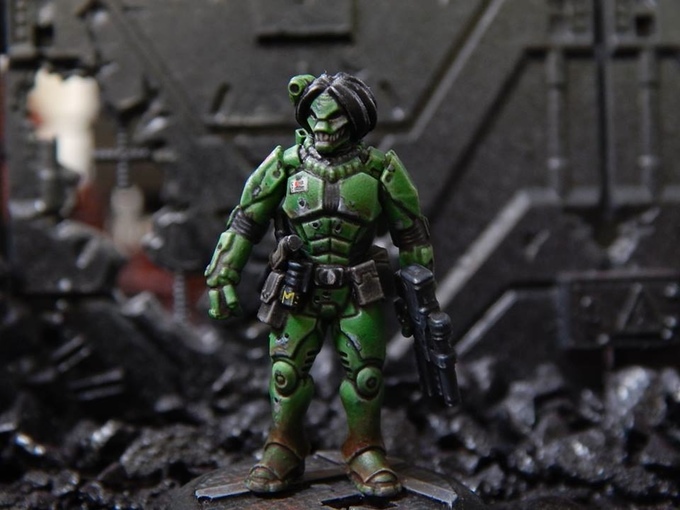 Does the world need a new 40K RPG? Modiphius Entertainment, publisher of the Achtung! Cthulhu, Mutant Chronicles, Conan, Infinity and John Carter of Mars roleplaying games, reveals today the Locutus of Borg miniature and announces its addition to the Borg cube collector’s edition boxed set for the forthcoming Star Trek Adventures roleplaying game, along with two bonus 15-page adventure PDFs. Called “the coolest box in gaming history” by Geek & Sundry, the massive Borg cube collector’s boxed set already contains the exclusive Lore miniature, plus a slew of other accessories for the Star Trek Adventures RPG, including the 368-page collector’s edition core rulebook, four sets of 32mm scale miniatures, three sets of Star Trek Adventures dice, Threat & Momentum tokens, a pad of 50 character & ship sheets, a poster of the Alpha and Beta Quadrants, the giant Borg cube Gamemaster screen with 6 laminated reference sheets for bridge positions and rules reference, and a 40-compartment foam tray for miniatures. Each Borg cube is uniquely numbered from 1 to 1701 with an official Star Trek Adventures hologram, with numbers 1-1000 only available at Modiphius.com. They are available for pre-order until 31st August 2017 at Modiphius.com/Star-Trek and in your friendly local gaming stores (£395.00 GBP/$650 USD), or fans can pick up the Borg drone bundle (£249.99 GBP / $322 USD). 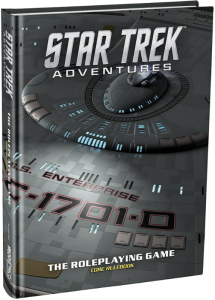 Further, the Star Trek Adventures core rulebook stand-alone PDF is now available on DriveThruRPG.com and Modiphius.net. 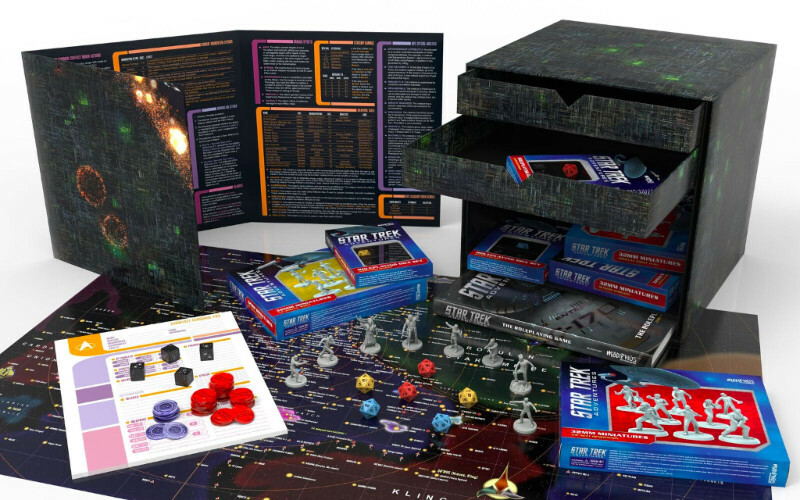 With a month to go until the game releases at Gen Con, fans can join Starfleet today and begin their mission exploring the Final Frontier and creating their own Star Trek stories. 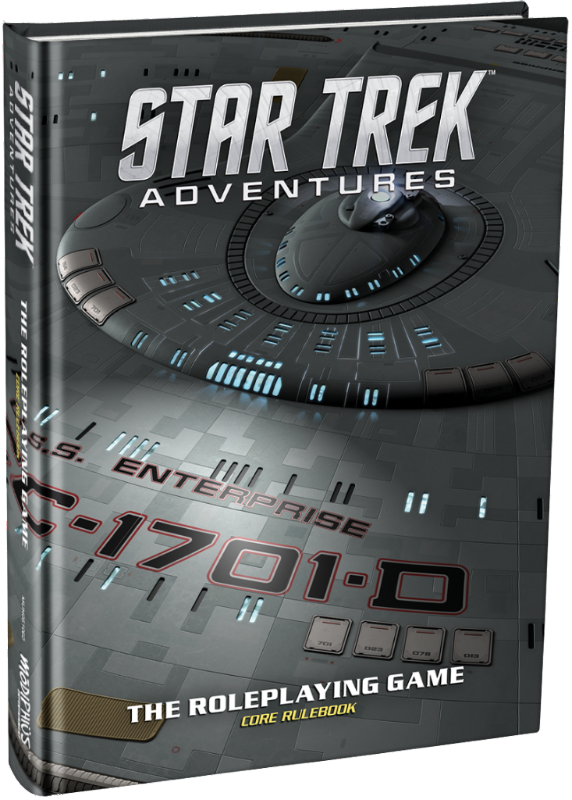 Star Trek Adventures uses the Modiphius 2d20 game system (Mutant Chronicles, Infinity, Conan, John Carter of Mars) designed by Jay Little (Star Wars: Edge of the Empire, X-Wing Miniatures Game). 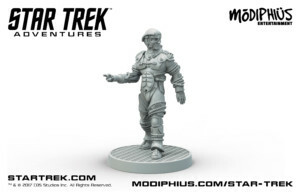 The accompanying Star Trek miniatures line features 32mm-heroic scale resin figures of classic Star Trek characters and crews, landing parties and away teams. Geomorphic tile maps of burning Federation ships, mysterious colonies and embattled Klingon cruisers set the scene for dramatic new voyages on the Final Frontier. 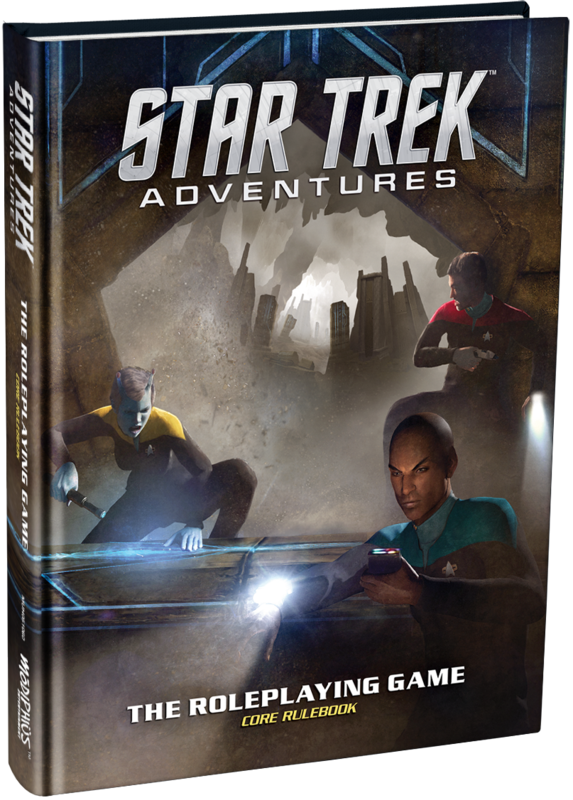 Under license by CBS Consumer Products, Star Trek Adventures releases in August at Gen Con and arrives in retail stores September 2017. ™ & © 2017 CBS Studios Inc. © 2017 Paramount Pictures Corp. STAR TREK and related marks and logos are trademarks of CBS Studios Inc. All Rights Reserved. 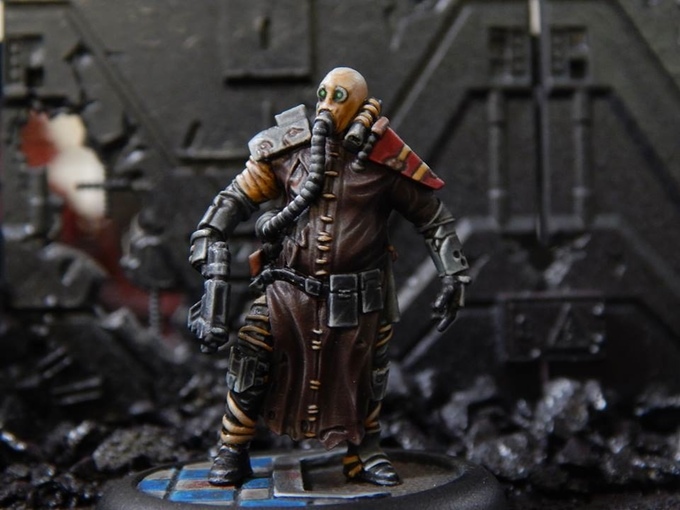 Modiphius Entertainment, publisher of the Achtung! Cthulhu, Mutant Chronicles, Conan, Infinity and John Carter of Mars roleplaying games, is thrilled to announce today the highly anticipated Star Trek Adventures Roleplaying Game, the first official Star Trek RPG in more than a decade, is now available on Modiphius.com for pre-order. The game will release around Gen Con in August 2017 and will be available in friendly local game shops in September. 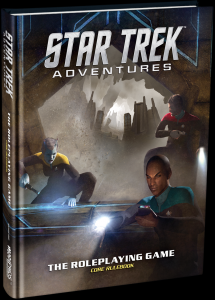 Star Trek Adventures will use the Modiphius 2d20 game system (Mutant Chronicles, Infinity, Conan, John Carter of Mars) designed by Jay Little (Star Wars: Edge of the Empire, X-Wing Miniatures Game). 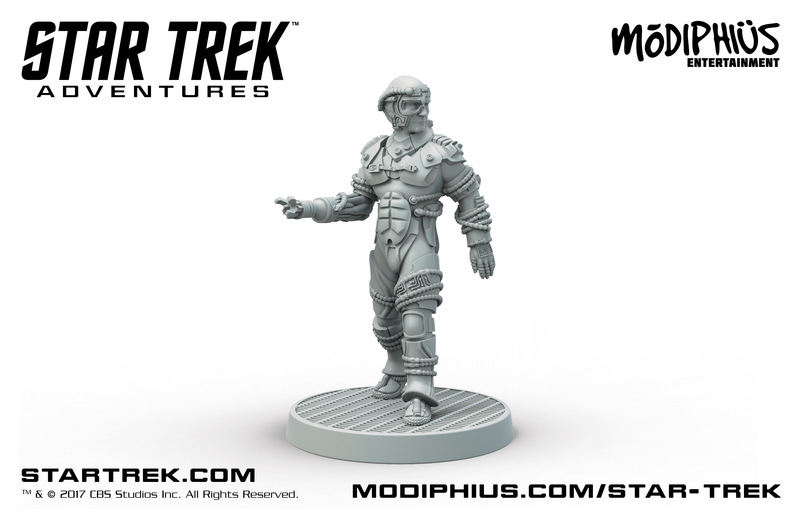 Modiphius is also sculpting an accompanying Star Trek miniature figure line, the first to be produced in 17 years. Resin 32mm-heroic scale hobby figures will feature classic Star Trek characters and crews, boarding parties and away teams. Geomorphic tile maps of burning Federation ships, mysterious colonies and embattled Klingon cruisers will set the scene for dramatic new voyages on the Final Frontier. 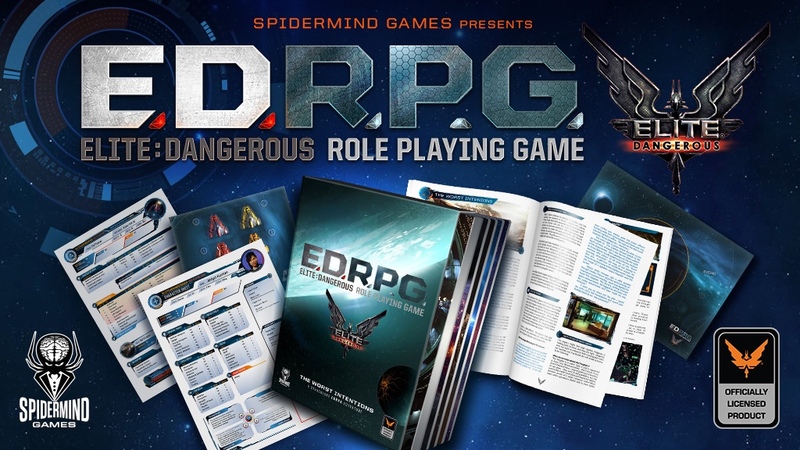 Based on Frontier’s successful Elite: Dangerous computer game, the Elite: Dangerous tabletop Role Playing Game lets you explore the deadly galaxy of Elite both in and out of the cockpit. Well-armed commercial spacecraft are as common in the Elite: Dangerous universe as cars in ours, making for a galaxy fraught with conflict. Own the famous Cobra Mk III, strap yourself in to the hyper-advanced Vulture heavy fighter, or cruise the galaxy in the over-gunned Anaconda cruiser. Explore planets in your SRV, demolish pirate bases in your private tank, or search the ocean floors in the Barracuda submersible. Get hold of the latest weapons and armour for desperate and fraught personal combat, including rare weapons that tip the balance of battle in your favour. Character creation: This ain’t the 1960’s! With corporate instability and a long, long lifespan no one follows a single career path in the 34th century. 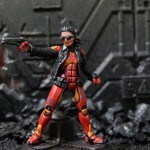 Create your character from multiple different backgrounds. Be a trained doctor from a rough frontier world who dabbled in gambling before becoming a petty criminal. Or an ex-cheerleader who got politicised in university and now fights the corporations as a fearless freedom fighter. Gain benefits no matter what area of life you came from and then sculpt your character to your liking with independent learning. Improve your skills as you use them, and gain access to Karma Capabilities and Enhancements that give you an edge when you need it the most. A fortune to be made. Deadly opponents to overcome. Can you be the best? Can you be Elite? 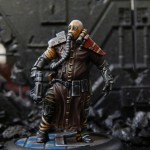 SLA Industries Skirmish Game – Kickstarter Closing Soon. The SLA Industries Skirmish Game has been many years in the making, so first a little history. Way back in 1993 Scottish company Nightfall Games released SLA Industries a science fiction/horror table top RPG. Dice and books not a computer in sight. SLA Industries (SLA pronounced SLAY) is a very British antidote to the slick and angsty settings that were popular at the time. Set in The World Of Progress, the sphere of SLA Industries’ influence in the known universe, players take on the roles of operatives, employees of an all-encompassing company that controls a frightened population with reality TV and violence while a creeping horror claws its way through the edges of reality. The game has seen renewed popularity recently, as Nightfall Games reclaimed publication, releasing source material as PDFs over the last few years. 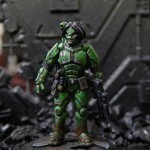 With the game returning to print in the near future, Nightfall Games partnered with Daruma Productions to produce a line of miniatures (including iconic characters like Halloween Jack and Delia the Destroyer) and a skirmish game to allow more people to enjoy the setting and characters of SLA Industries. 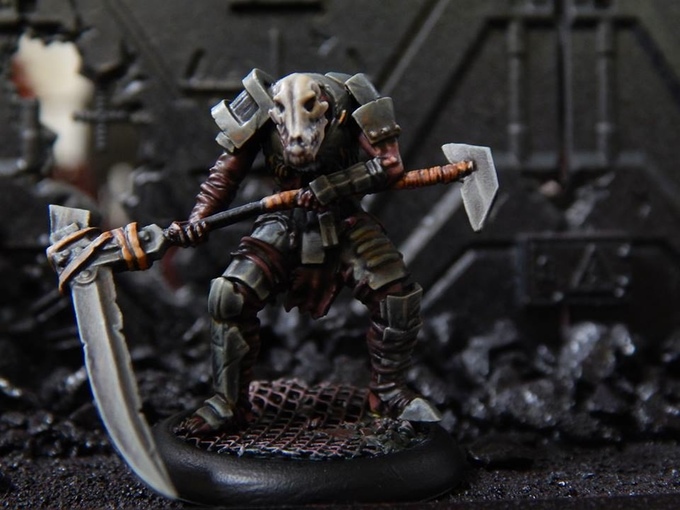 Daruma Productions have already produced a number of miniatures Scavs, Shivers, Carrien and a couple of heroes for the SLA Industries Skirmish Game and the Kickstarter launches the rules! Rewards for the Kickstarter include the printed rulebook and faction cards. What you are funding is the rulebook and faction decks. The book is to be full-colour with all-new illustrations by Dave Allsop, designed by Nightfall Games and written by Daruma Productions with dozens of pages of new background and information by Dave Allsop and Jared Earle, two of the original writers of SLA Industries. Our head of Rules Development is Brad Zalad, a familiar face in the UK tournament scene. 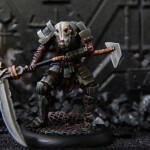 He runs a tight ship ruleswise and is keen that SLA Industries: Cannibal Sector 1 is a balance between tight, tournament-ready rules and scenario-driven narrative games. Along with the gorgeous rulebook, you will be getting faction decks and other goodies depending on your pledge levels, all fresh from the high-quality Daruma Productions facilities, including exclusive bags and shirts. Under the name TERA: Rising, the publisher Gameforge is making one of the most graphically impressive and innovative fantasy MMOs in recent years playable for free. Appearing at the same time as the free-to-play launch, the new dungeon, Crucible of Flame, and the Champions’ Skyring 3 vs 3 arena offer players many new challenges and rewards. The free-to-play launch is accompanied by exciting new content for both PvE and PvP fans. There is a new dungeon, the Crucible of Flame, as well as the Champions’ Skyring 3 vs 3 arena. The Crucible of Flame offers a completely new kind of dungeon experience: As players battle against monsters and bosses at various difficulty levels, they compete for dominance in a ranking system. Challengers who reach the top levels can look forward to valuable rewards. The Crucible of Flame is also home to a brand-new boss monster – the Cyclops. Meanwhile, the dungeon’s engaging mini-games provide a refreshing change of pace. In the Champions’ Skyring, Arborea’s adventurers can put their skills to the test in thrilling 3 vs 3 battles. The victors will be rewarded with the newly introduced Killing Spree Credits, which can be used to obtain special PvP equipment. The top ranked players here will also receive a powerful new skill. The new spectator mode allows fallen heroes to watch the battle unfold from another player’s point of view. The free-to-play model of TERA includes two basic account types: Free Users and Veterans. Free Users enjoy full access to all of the game content. Veteran status is reserved for those who purchased TERA before the free-to-play switch, and offers certain advantages in terms of convenience. It is also possible to join the TERA Club with membership benefits such as a special mount, a daily selection of boosts and various scrolls, and much more. Click here for more information on the two account types, the TERA Club, and the in-game shop. More details on the new dungeon and the new arena can be found here. Those who want to take part in the free-to-play adventure can resister for TERA: Rising at www.tera-europe.com and jump straight into the fascinating world of Arborea. Cubicle 7 is pleased to announce the forthcoming launch of its new fiction imprint ? Cubicle 7 Fiction . In cooperation with the established and successful Solaris and Abaddon Books imprints, Cubicle 7 Fiction will publish between three and five novels and anthologies a year based upon its terrific science fiction, fantasy, and speculative properties. Mindjammer will be released in ebook format late this month, with a release of physical print edition to follow. Additional titles will be announced in the months to come. Cubicle 7 has already earned a stellar reputation thanks to the quality of the RPG games, which range from aliens and trans-humans to vistas of a far-flung future and Steampunk dystopias peopled by Frankensteinian monsters. 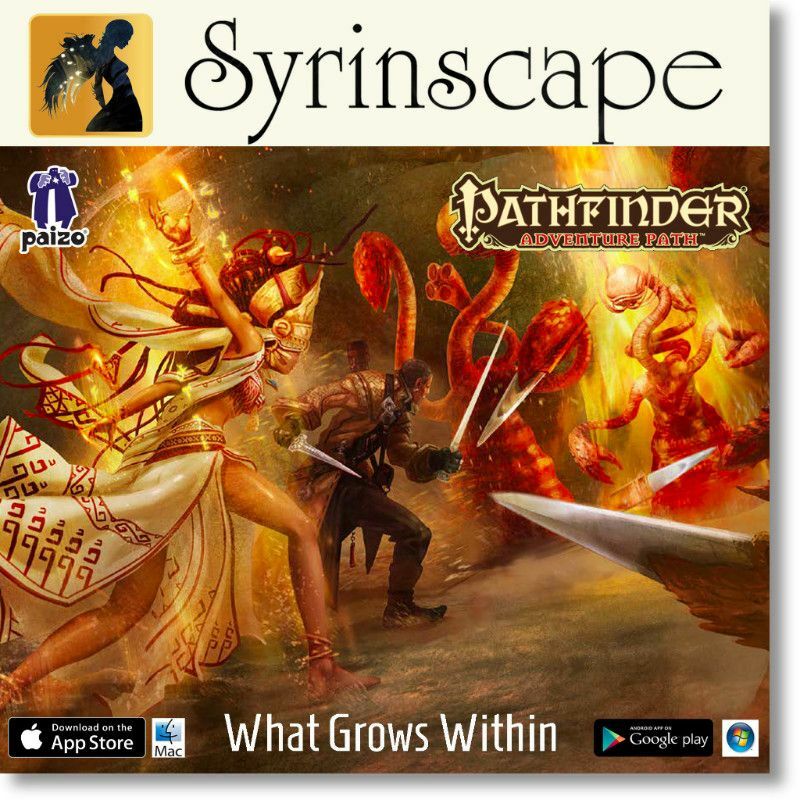 Its stable of imagination-fuelled intellectual properties has inspired and driven numerous roleplaying game lines. ?With Solaris, Abaddon, and Cubicle 7 all under the Rebellion umbrella, we have a great opportunity to expand the scope of our settings,? said Dominic McDowall-Thomas, CEO of Cubicle 7. ?We?re in a great position to take advantage of the expertise and resources of an established publishing house, and we can bring our properties to life in a way that supports the games but also allows the fiction to stand on its own.? Players eagerly awaiting Battlestar Galactica Online, the highly anticipated space combat MMOG from Bigpoint, can get a ?jump? on the competition and be the first to launch a Colonial Viper or Cylon Raider by visiting Syfy.co.uk where the open beta for the new game will be available exclusively for one week only beginning Tuesday, February 8th*. Also available to players only at Syfy.co.uk ? and international Syfy Universal websites ? 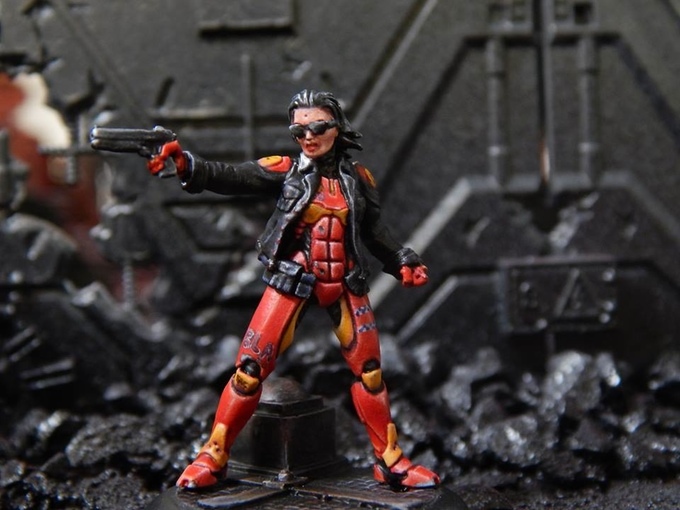 are an awesome set of Syfy-inspired Viper and Raider designs, which players can choose to represent them in the on-going battle between the Colonial and Cylon fleets. Battlestar Galactica Online is a free-to-play, browser-based space combat MMOG that combines high-quality, 3D graphics with intense gameplay. Bigpoint ? the global market leader in browser-based massively multiplayer online games (MMOGs) ? designed and produced the game, which is based on Syfy?s award-winning, internationally popular television series Battlestar Galactica, produced by Universal Cable Productions. In Battlestar Galactica Online, both the Colonial and Cylon fleets find themselves stranded in an unexplored area of space at the very edge of one of the galactic arms. Heavily damaged and critically low on resources, both fleets race against time to repair and rearm, struggling for control of systems rich in Tylium, metals and water. The Colonial fleet desperately searches for a way to escape and continue the search for Earth before the Cylons gain enough strength to destroy them once and for all. In addition to the exclusive one week open beta period at Syfy.co.uk, Syfy will also be Bigpoint?s exclusive media partner for a period of six weeks with exclusive marketing rights in the UK (http://www.syfy.co.uk/battlestar-galactica-game). Syfy will also make the game available on its other international websites; US, Germany, France, Spain, Poland and Russia. Additional Syfy Universal international websites will be added in the weeks following launch. 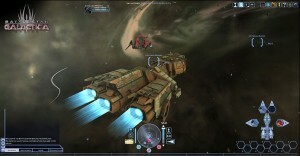 In developing Battlestar Galactica Online, achieving the highest level of detail and accuracy was a design requirement. 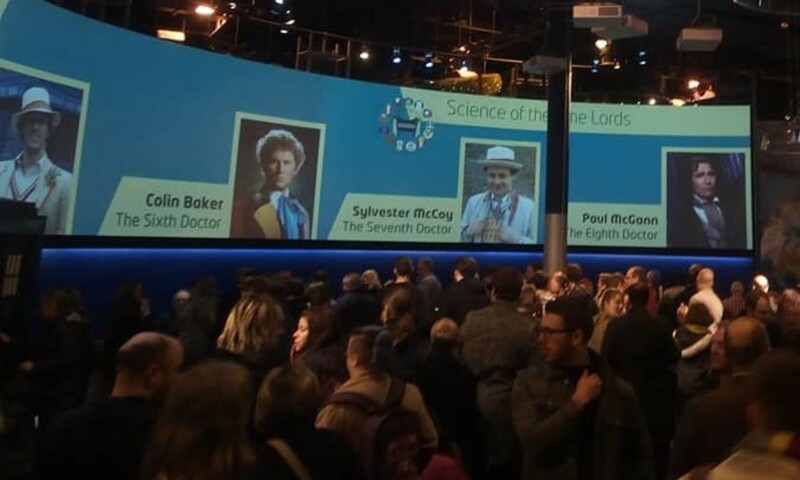 Assets from the television series have been incorporated into the game, including non-player characters (NPCs) based on popular characters Number Six, Boomer, Starbuck, Admiral Adama, Chief Tyrol, John Cavil, and Leoben Conoy. In the game, players can customize their human or Cylon avatars, engage in PvE and PvP space combat, complete missions, conduct mining operations, and explore capital ships, outposts, and bases. Battlestar Galactica Online is licensed through Universal Partnerships & Licensing on behalf of NBC Universal Television Consumer Products Group. 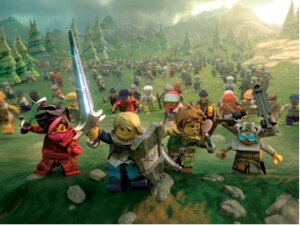 The LEGO Group will soon be launching its first ever MMOG (massively multiplayer online game), called LEGO Universe! The game is currently in BETA testing and pre?order will be coming soon, the game will be available exclusively through shop.LEGO.com and LEGO Brand Retail. Think Lego does World Of Warcraft! LEGO Universe is the first MMOG for LEGO fans! It’s a giant new online world where players from all over Earth can safely build, play and pal around together! The game will offer endless building opportunities, both solo and cooperative, to casual enthusiasts and the most advanced LEGO builders. It has no “shelf?life” because the storyline, characters and other content change continuously and evolve over time! Create your own LEGO Universe Minifigure and become your character in an epic battle between good and evil! The in?game action takes place in a world where a dark and destructive force, called the Malestrom, threatens to forever extinguish the light of pure imagination!